Need to find a pet friendly hotel in Destin FL? Click the Pet Friendly Accommodations Button below!" Welcome to paradise where white sandy beaches meet the warm emerald green waters of the Gulf of Mexico. These unspoiled surroundings foster life-long memories of family vacations and unforgettable romantic getaways. There is more to do than lie back in your beach chair and enjoy a dramatic sunset. There are nearby golf courses, you can scuba dive, rent a boat or go deep sea fishing. Dine in one of the casual beachfront restaurants or shop in the boutiques. Destin is a Vacation For The Soul where you can take a break from the daily routine. Sit back sip a cool drink and enjoy the Florida sun. 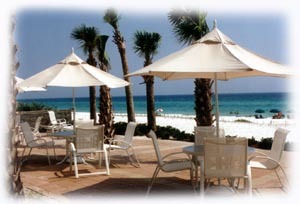 It's easy to find pet friendly hotels in Destin with PetTravel.com. Just click the SEARCH button above for a list of pet friendly hotels, motels, bed and breakfasts, small inns, and vacation rentals in Destin. If we have information for other pet friendly services in Destin, a second search button will appear that will include pet friendly beaches, parks, and other fun things to do with your pet. We welcome your emails regarding pet friendly services in your town. Just send an email to info@pettravel.com and we will add them to our database. Come back often as we are always adding new and exciting places for you to visit with your pet. We even offer pet sitters in selected cities who will "petsit" your best friend while you go out to dinner in Destin.